Mexican food is a favorite in our household. From tacos to salsa we love it all. One of the things I love to create is fresh salsas and different flavors. I think sweet and spicy always go great together. 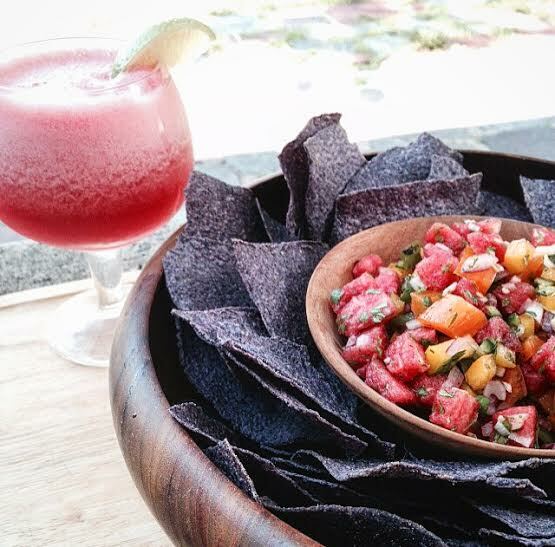 So I took a summer staple, a watermelon, and created a delicious refreshing salsa. A lot of people might think it’s weird but it works. I hope you give it a try. I promise you will not be disappointed. Also you can’t have salsa and not have a delicious margarita in hand. I used the rest of my watermelon to make a homemade margarita. Place all of the above ingredients in a large bowl and toss until well incorporated. Enjoy with tortilla chips. In a blender place all of the above ingredients and blend. Serve with salt or sugar on rim or nothing at all. Cheers! This looks so good! I love watermelon salads in the summertime because they’re so refreshing, but I really like your take with tequila–I mean, who can go wrong with that?! Was great co-hosting with you last night on #Foodiechats!